Any time you can knock out some cool engagement photos and snag some cold cuts along the way, it’s been a pretty good day in my book. Ok, what the hell am I talking about? I’m talking about Michele and Kelvin and we’ll get to the cold cuts soon enough. We’re asked to do some engagement photos in pretty unique places. Actually we really encourage unique places, but the Weis Market, formerly Mr. Z’s in Hamlin, was a new one. But it made perfect sense to Michele and Kelvin. They met there when they were teenagers. That’s right, teenage sweethearts about to get married. I love that story. And honestly, I love their photos from the grocery. I love that it has special meaning to them. I love the uniqueness of it. I love shopping carts. And as it turns out, so do they. Now, I go into most jobs with a pretty good idea of what we are going to do, some nice ways to pose a couple and ideas of how to use the light … that type of stuff. I had no friggin’ idea what to do in a grocery store. Bunch of long aisles, fluorescent lights. I don’t want to say I wasn’t optimistic because that would not be my nature. Concerned? Hell yes. Which brings me to my next point. How the heck did I not think about shopping carts when I was getting a game plan together for this? Fortunately it eventually occurred to someone in our group that they would be a damn good time. So we raced around the aisles. Kelvin hopped in the cart while Michele pushed. Michele hopped in the cart while Kelvin pushed. 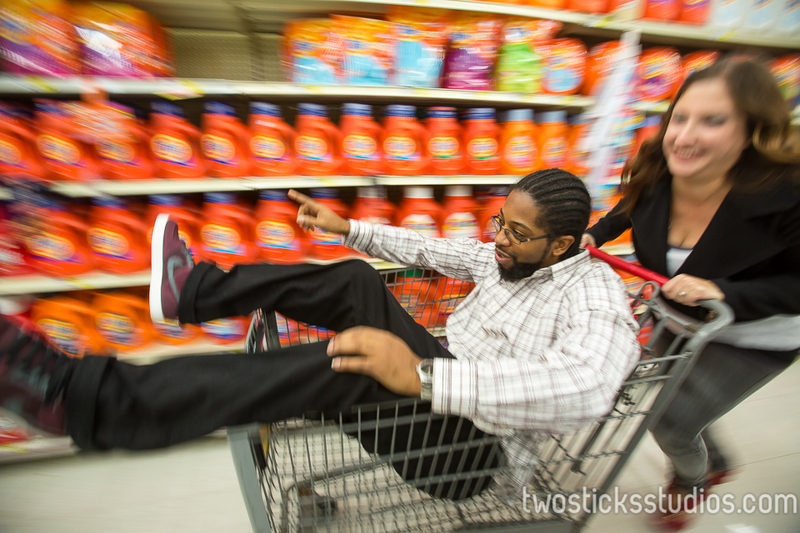 They had races down the detergent aisle. At one point during one of the races, we threw Bob in a shopping cart while I pulled it backward as fast as I could as Michele and Kelvin raced down the aisle. It was like a rudimentary steadi-cam. 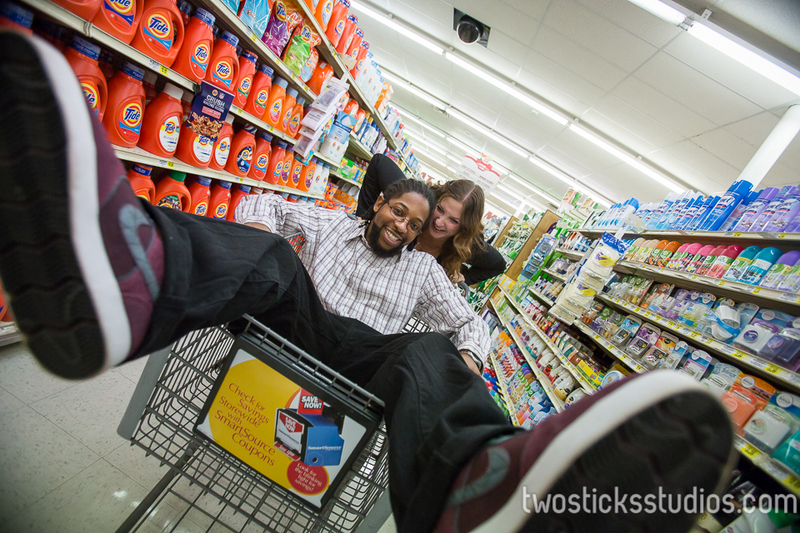 Anyway, we loved our time with these two and wanted to share just a few shopping cart photos. There will be more to come!